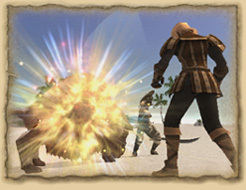 Firing off weapon skills in sequence creates a skillchain, which can cause lots of damage to monsters. There are eight basic types. If you don't understand the differences between these types, you'll get hopelessly lost, so pay attention. Every weapon skill can start or end a skillchain. Us adventurers always gotta work with our buddies and use our weapon skills two or three (or more) at a time, one right after the other, to get skillchains when we need them. You wanna know why we need them at least two in a row? The effect of the first weapon skill combines with the effect of the second, as shown in the chart below. I don't quite get why it works this way but it comes out something like you see there. Of course, you can't use the same weapon skill twice in a row; you hafta put them together right. Luckily, I've provided a handy chart to show you how to do that. Just try to get an effect on the left side to come out right after an effect on the top. I'll give you an example to make sure you understand real good. So you've just used Flat Blade (which can let loose an Impaction effect). Now we're set up to make either a Liquefaction or Detonation skillchain. So now I use Gust Slash at just the right time, and presto! We get a Detonation skillchain, and whatever we are fighting gets hurt real bad. Get it? Huh? You don't know what skillchains your weapon skills will lead to? S'alright. You're an adventurer. You'll figure it out soon enough, just like I did. But weapon skills often hide more than one skillchain effect, sort of like magic users using different types of spells. And there are more than a hundred weapon skills. I can't even remember all the names! But that's not what we're talking about. One skillchain can lead to another. So now you and I have just done a Detonation skillchain. If one of our buddies does a Fast Blade, he unleashes a Scission skillchain. Oh yeah. I forgot to explain the element of each skillchain. These are the elements of the various skillchains. Learn 'em well. No matter what you're fighting, it has a weak point--and when you're gonna use a skillchain, it's best to use one that has an element your monster is weak against. The last thing I've got to tell you is that once you've finished your skillchains, you can throw in a spell of the same element as the last skillchain to create a magic burst. Howzat? D'ya think skillchains are a little more interesting now?